We were flying through the woods on the ATV, yelling at the top of our lungs, completely unsure of where we were—and having an absolute blast. When we finally made it back to the house, I thought: This is exactly what I want to be a part of! I said in my last article that a phrase I’ve learned to say in planting a church is: “I don’t know.” I know Jesus is full of grace and truth. Beyond that, I don’t know many definite answers when it comes to handling the messes in our lives. This phrase doesn’t just apply to the messy situations I encounter in ministry. It also applies to how we do church. 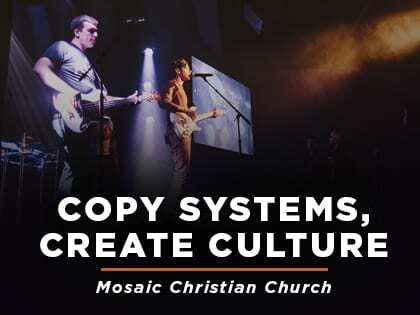 Therefore, one of the things we say at Mosaic is: Copy systems, create culture. I am convinced—through much trial and error—that this is the best way to lead a church. The thing is, most churches do it backwards: They try to create systems and copy culture. When I first planted Mosaic Christian Church, I thought I had to re-evaluate every aspect of theology and how it’s lived out in order to end up with the “perfect” church; i.e. the church that did things exactly how the apostle Paul would do them today. So I spent my time asking questions like: What is a disciple? How do I grow a disciple? How do I get a disciple to multiply? What habits should a disciple have? And on and on and on. Here’s what I realized: There are hundreds of great books on those questions. There are conferences on discipleship, podcasts on discipleship, endless resources on discipleship. But … if there was a perfect discipleship system, there wouldn’t be the need for fresh books on the subject. So instead of trying to figure it out from scratch, we decided to copy someone else. We found a discipleship system we liked (because it was biblical and simple), implemented it and we haven’t looked back because of the great fruit we’ve experienced from it. At the same time, I realized that my temptation when planting a church was to copy the culture of several great churches I loved. After all, they looked like churches I’d want to work at, so, I thought, I might as well copy their culture. I copied it all at various times: their cultural values, their meeting schedules, the way they had fun, their dress codes, what their services looked like, how they worshiped and on and on and on. I soon learned this was the wrong way to go. If systems are the map to a vacation spot, culture is how you have fun when you’re there. And while I trust Google Maps to get me to the beach, I’ll decide for myself how to have fun when I’m there, thank you very much! So we work hard on creating a great culture. We instill traditions in our church and on our staff—traditions that WE look forward to, because if we don’t look forward to them, no one else does, either. A huge part of this is having FUN. I just got back from our staff retreat, where we invite spouses and pay for childcare. We play a lot on jet skis and the ATV—which may or may not have flipped over. I teach several sessions. But the main thing that happens is the culture we want gets created—real fun, raw authenticity and deep relationships.